With the support of LA Urban Farms, the USC Hospitality Group successfully opened the USC Teaching Garden in March 2016. LA Urban Farms (co-founded by USC alum, Wendy Coleman) is a full service urban produce grower utilizing Tower Garden® aeroponic technology developed by the world leader in vertical aeroponics. This state-of-the-art vertical patented technology is the perfect solution for farming in an urban setting. This technology is approved by the US Green Building Council for LEED points on certified Green buildings. We are the first university in the nation to have a farming effort of this scale using vertical Tower Garden® aeroponics technology. Aeroponics is the process of growing plants in an air or mist environment without the use of soil. Fruits, vegetables, herbs and edible flowers can all be grown in this garden without the use of any soil or harmful chemicals. The seeds used in the garden are 100% organic and the plants are fed all natural water based ionic minerals and plant nutrients. The plastic is FDA food grade approved plastic & UV stabilized for outdoor protection. Leafy greens &herbs can be harvested in just 21 - 28 days. The towers are remarkable in the way they sustain plant growth while using 90% less water and 90% less land than traditional gardens. The USC farm is growing 2,640 nutrient dense plants in just a 60’ x 20’ square foot space. 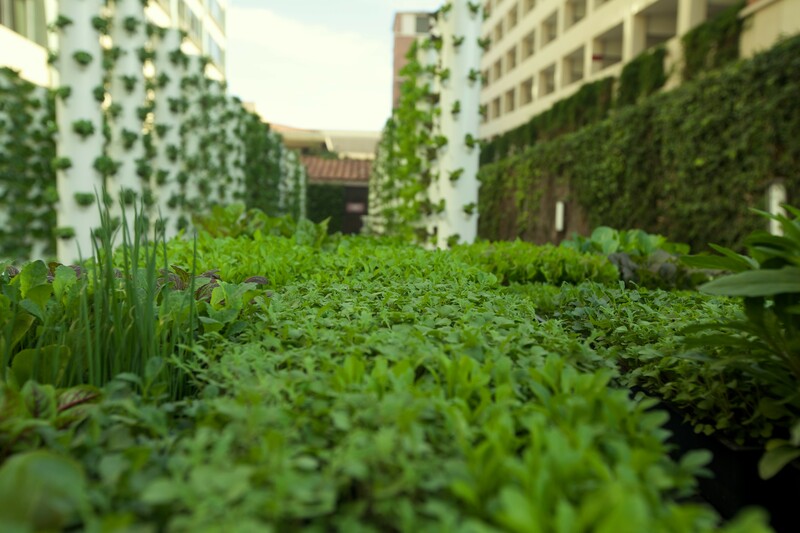 In addition, USC culinarians are given access to the garden to grasp the significance of environmental impact we have on the earth in farming our own produce. Through the process, USC Chefs have strengthened the pride they have in serving guests using farm-to-table methods. What was once an empty, colorless patio has now transformed into a tranquil, vibrant haven of growth, health and life. It is cornerstone to empowering chefs, students and guests of USC to consider the food which they eat and how this food is grown.